Search engine friendly layouts are optimized as per the modern-day SEO requirements. It grows the opportunities they're going to be discovered online, therefore expanding your web-site's rank positions in search engine results. SEO helps to get to the top of Google search results and match the ranking factors necessary for the most common search engines. Thanks to that your website is visible on the web. It is an ability of the website to instantly adapt to any screen dimension and resolution. It is good since the website can be reached by more viewers from the vast number of gadgets. Parallax is a CSS animation effect that makes background elements move less quickly than the front content. It is one of the most cutting-edge trends in the current website design. Animation effects make the web-site more compelling and appealing. Parallax is a type of current trend, consequently using it at your web business not simply can make it more attractive but also better looking. Portfolio website is a type of website that lets presenting various items (services, artworks, merchandise, and so on). Through a portfolio, you may make your projects be noticeable. While including the portfolio in your resource site, you expand the possibilities that the customers should be engaged with your articles and other content and thus revisit for further investigation. Online chat makes reference to any kind of conversation that takes place over the Internet within the real-time. On-line chat could be the simplest approach to connect with any visitors and turn them into your shoppers. It is a wordpress plugin for designing multilingual online sites based on WordPress. Using WPML, you can actually translate pages, articles, custom post types, a taxonomy, and menus. Bootstrap is an open-source framework for building websites. Using such a framework noticeably enhances the whole process of producing web pages. Standard designs are super easy to adjust, which provides an adaptable and simple approach for building site designs. I would like to purchase WP template for Business News , but it is not available on the site anymore. The WP template for Business News has been sold out for exclusive price or discontinued.As technology inevitably develops, TemplateMonster may discontinue the production of certain products. It can be no longer available for sale because of being outdated. Is it possible to reactivate my download link for WP template for Business News if it was deactivated after 3 days? Yes. Please re-activate the download link for WP template for Business News within your account under the Downloads tab or contact our billing department directly regarding that. 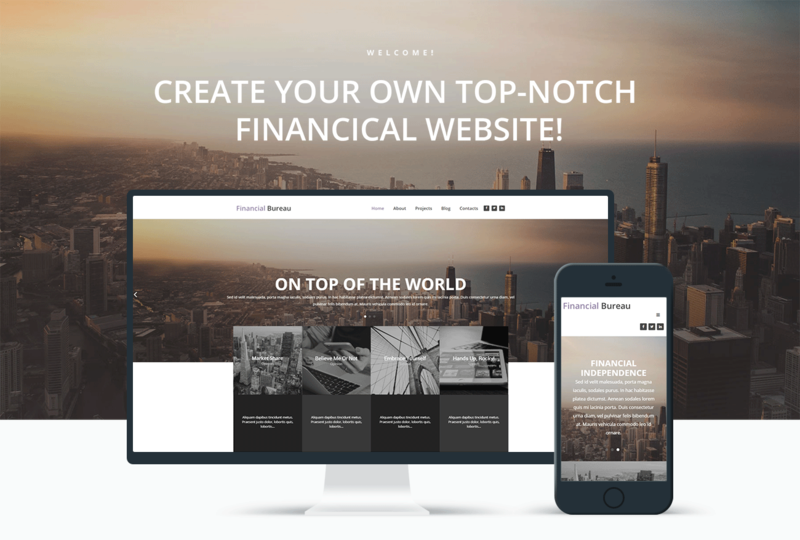 Will you help me to customize my WordPress theme for Financial Advisor Services? We do not provide any help or instructions on WordPress theme for Financial Advisor Services customization except for www.template-help.com help center. If you are not sure you can customize the template yourself we recommend to hire a design studio to customize the template for you. What is Developers License for WordPress template for Business Magazine ? If you purchase a Developer's license, you are granted a non-exclusive permission to use the WordPress template for Business Magazine on up to 5 domains for projects belonging to either you or your client. I like the image from the WordPress design theme for Services and would like to use it for my advertising campaign, can you send me this image in a higher resolution? No, we can't provide image in higher size or resolution rather than it is on the WordPress design theme for Services. We recommend looking for professional images on online photo resources. Can I put low resolution thumbnails of WordPress themes for Financial Advisor Blog on my website for my clients to choose designs? I ordered a Business Company WordPress design theme but haven't received the download information. In case of not receiving the download information of a Business Company WordPress design theme, please contact our Billing Department via support chat by phone or e-mail. Is it reasonable to make unique purchase of WordPress theme for Financial Advisor Blog that was already purchased before? Yes, it's reasonable to make a unique purchase of WordPress theme for Financial Advisor Blog. Because there is very small chance that you will find the same design on the net. There are more than 3,000,000,000 webpages online now according to statistics on www.google.com. Can I resell the customized WP theme for Finance Articles? Yes, you can redistribute WP theme for Finance Articles under the terms of the GPL as well. What am I allowed and not allowed to do with the Small Business WordPress design themes? You may: Build a website using the Finance WordPress design theme in any way you like.You may not:Resell or redistribute templates (like we do).Claim intellectual or exclusive ownership to any of our products, modified or unmodified. All products are property of content providing companies and individuals.Make more than one project using the same template (you have to purchase the same template once more in order to make another project with the same design). Can I contact the WordPress design for Financial Company author? Yes. You can contact this WordPress design for Financial Company author/author's team directly using your personal account under the Support tab. Can I customize the Financial Advisor WordPress template if that's required by application settings? Yes, you can customize the Financial Advisor WordPress template code, graphics, fonts to any extent needed. Is it possible that Template Monster will contact my client which website I made from Template Monster's website Tax Advisor WordPress design? Yes, our legal department checks licenses regularly. In case we won't find designer's contact information on the site which was made from the Tax Advisor WordPress design of ours we will contact the owner of the site directly. Can I resell the WordPress template for Financial Advisory Company as is? No, you cannot resell the WordPress template for Financial Advisory Company as is. What is a unique purchase license for WordPress template for Financial Advisory Company? 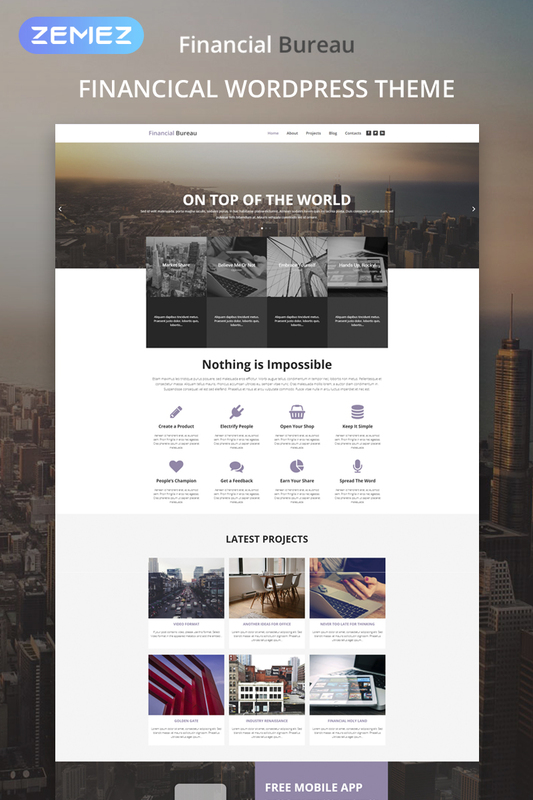 If you purchase the product at a â€˜Unique price' it guarantees that you are the first and the last person to buy this WordPress template for Financial Advisory Company from us. It means that this template has not been sold before and you become an owner of a unique design. After this kind of purchase the template is being permanently removed from our sales directory and is never available to other customers again. The unique purchase license allows you to develop the unlimited number of projects based on this template, but the template should be customized differently for every project. Can I put a line at the bottom (or any other spot) of my new product "Website development by Company name" after purchasing WordPress design theme for Business Financial Advisor? Yes, you can place a note at the bottom (or any other spot) of my product "Website development by Company name". Nevertheless, you cannot place "Website design by Company name"while using one of WordPress design theme for Business Financial Advisor. I have customized the WP theme for Business Firm and would like to protect my content by copyright, can I place Copyright, Mycompanyname.com? After WP theme for Business Firm purchase you can put your copyright to the template. But you cannot place a line at the bottom (or any other spot) of the customized project saying "Website design by Company name". Nevertheless, you can place "Customized by Company name". What are the advantages of purchasing a Tax Advisor WordPress design? The major advantage of purchasing a Tax Advisor WordPress design is price: You get a high quality design for just $20-$70. You don't have to hire a web designer or web design studio. Second advantage is time frame: It usually takes 5-15 days for a good designer to produce a web page of such quality. Make sure that these charges for WordPress design theme for Business Company have different order IDs. If it is so, contact our billing department. Are your WordPress templates for Financial Advisory Companycompatible with any CMS? What is GNU GPL v3.0 license and can I use it with Business Company WordPress design theme? If you buy a Business Company WordPress design theme released under GNU General Public License v3.0, you can use it on any number of projects belonging to either you or your clients without any limitations. This license allows you to modify the template and its sources to suit your needs. Can I integrate the WordPress design for Financial Advisor Magazine with third-party software or applications for development of my new products? No, you cannot get the developers license for development of WordPress design for Financial Advisor Magazine or other products. Can I resell the WP themes for Online Financial Advisor I bought the extended license for? No, you cannot resell the WP themes for Online Financial Advisor as is. You can only sell them as the integral part of your new product. Are there any limitations on selling the Financial Advisor WordPress template as the integral part of my new product? Very nice looking template. We had a little bit of trouble with the set up seeing as we were given the two themes (child theme). Looks great though. Este template, &eacute; muito pouco escal&aacute;vel, dispoe de muito poucos elementos, dificil de se trabalhar. N&atilde;o recomendamos a aquisi&ccedil;&atilde;o.
very good Template for my customers, it very easy to configure. A pleasent template to work with, well integrated with Cherry Framework and the rest of the plugins and widgets that compose it&#039;s pages. Documentation is good although generalized through all the templates that use Cherry Framework, sample data was complete and the process of importing it was uncomplicated. Code is well written as far as I can tell, using the correct WordPress core functions to deploy the different blocks of the template. Clean design template for a company in US that work with brazillian customers, You can visit the site at this URL: plusa.com.br . I&rsquo;m a brazilian webdesigner, running a small business at my country. Template Monster has been a amazing supplier, providing me many Wordpress templates, i can delivery the job before the deadline and my clients are very satisfied so far. Template Monster support is very good, and reach our expectations as well. Cherryframework allow us to have many great effects and features, i recommend you to keep update due the old version security bug. The SEO and responsive settings ia good, and this template is easy to customize. I have no complains to this template. As a professional website designer I purchased this Wordpress template for a law firm that specializes in criminal law based out of South Carolina. I specifically selected a Wordpress theme because I am an advanced WP developer and well versed on creating WP themes and working with them. Me and the client picked this template because of the professional style and modern look/feel. For a very longtime I have been working with various Wordpress themes from TemplateMonster and I find them easy to work with compared to other themes out there. We liked the homepage slider a lot because it stretched the whole width of the page and the 4 smaller boxes which overlapped the carousel. We also liked the fixed navigation bar at the top of the page. The theme was fully responsive which is a must theses days. As normal I did need to make some modifications to the theme to make is usable for the client and to fit within their style guide. For example I added a contact form over the slider and changed the colors from purple to blue. Of course we had to add their company logo replacing the example/stock logo. I did need to contact TemplateMonster support about the Google maps API but besides there I only had minimal trouble with it. Luckily the clients logo fit very well in the space provided which often times is not the case. Overall this is a good theme style-wise but problematic if you had a larger logo to add. The site has been completed and so far so good as everyone including the client is very happy with the website thus far. This Template works in a wix.com ?